KANSAS CITY, Mo. - The Red Sox are hoping a cortisone shot and 15 days on the disabled list will allow Kevin Youkilis to return to the lineup in reasonable health for the remainder of the pennant race. 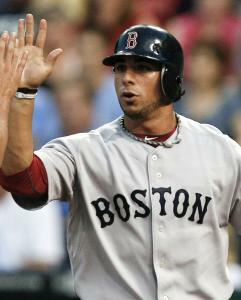 The third baseman remained in Boston to have his sore back examined. According to the team, Youkilis has a lower back strain. Youkilis was placed on the DL, with catcher Ryan Lavarnway promoted from Pawtucket to take his spot on the active roster. “Structurally, I think he came out [of the examination] pretty sound,’’ manager Terry Francona said before the Red Sox’ 4-3 win. “Take some time to kind of let that recover. His body was so beat up anyway. This was like the last straw. It just kind of put him over the edge. It has been a rough season for Youkilis, who has missed games with injuries to his left shin, left hip, left ankle, upper back, and right hamstring. Despite the physical issues, he is hitting .266 with 17 home runs and 78 RBIs. Francona said he was hopeful Youkilis would return after 15 days, which would make him eligible Sept. 2. When Clay Buchholz went on the disabled list June 19 with a lower back strain, it was not expected to be a long-term problem. He has not played since. Ortiz ‘a little better’ David Ortiz reported to the clubhouse wearing a black medical boot to take pressure off the bursitis in his right heel. But he quickly changed into some Crocs and walked across the room without limping. “I’m a little better,’’ he said before disappearing into the trainer’s room. Ortiz has missed the last three games and it appears unlikely he will play in this series, if not the entire eight-game road trip. According to Francona, the plan is for Ortiz to wear the boot for three more days and then take “two, three, four days’’ out of spikes before taking batting practice for a couple of days. That would put him out 7-9 days. “They’re hoping that will knock it out,’’ Francona said. Francona said having Ortiz and Youkilis out of the lineup is a problem, but not an excuse. Royal treatment Mike Aviles started at shortstop in place of Marco Scutaro. Aviles was drafted by the Royals in 2003, made his major league debut in 2008, and played in 301 games for Kansas City before being traded to the Red Sox July 30 for Yamaico Navarro and a minor league pitcher. Until yesterday, Aviles had never been in the visitors’ clubhouse at Kauffman Stadium. Aviles said the Red Sox have made him feel a part of the team since the day he arrived. Aviles received some applause from the crowd when he came up in the third. He singled to center and scored. Scutaro was out for the fifth straight game because of a sore back, but he hopes to play today. As for Navarro, he played two games for the Royals before being sent to Triple A Omaha, where he is hitting .205. Crawford scuffling Carl Crawford was in an 0-for-15 slump with eight strikeouts before hitting a leadoff single in the fourth inning. His night went south again after that though, with a strikeout looking and fly out to left. His dramatically open stance has been faulty. “It’s been tough,’’ Francona said. “Little bit late again on his setup. When he gets back to closed, it’s a little late, so he’s rushing. He knows it. We know it.’’ . . . Andrew Miller (5-1, 5.40 ERA) is scheduled to start tonight, his first since July 31. He has thrown three innings in relief since, making two appearances. Miller will be working on eight days’ rest, which could affect his already problematic command . . . J.D. Drew, out with a shoulder injury, took batting practice on the field again. But there seems to be no rush for Drew to start a minor league rehab assignment as Francona said the right fielder would be evaluated again in a few days . . . Lefthander Randy Williams was designated for assignment to make space for Lavarnway on the 40-man roster . . . Before the game, several players watched the Little League World Series game between Japan and Aruba with great interest. Dustin Pedroia was amused that Aruba pitcher Gillian Wernet (5 feet 8 inches, 187 pounds) is bigger than he is.